Football Raincoat with Key Chain Football Raincoat with Key Chain is exquisite and nice, which is a daily necessity that people carry every day. 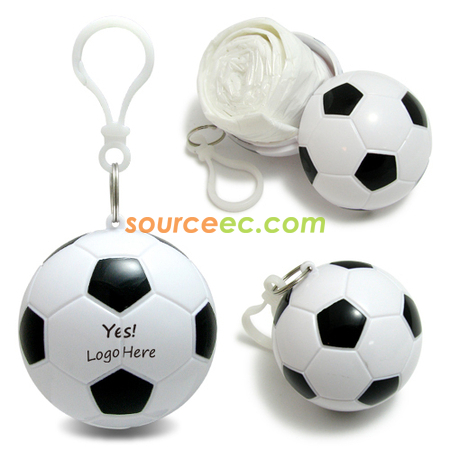 Football Raincoat with Key Chain is an ideal promotional gift, because it is inexpensive, moreover, there is a prominent space to make advertisements. Although it is a small key chain, sometimes it can give us an unexpected surprise. Go out and back home every day, with little cute Football Raincoat with Key Chain, you would surely be able to use it one day which is a sudden rainy day. Imprint with the company logo, key chain can make your target customers see the messages you want to advertise every day. A Football Raincoat with Key Chain conveys the joy and fun of life to people, which makes people feel warm and relax the moment they lock or open the door.